If you’re anything like us, the idea of crowding onto a packed beach on a hot day wearing nothing but beach underwear isn’t always appealing. So we’ve partnered with Drumstick to uncover near-by, top-secret swimming spots you just have to know about. Pack your snorkel, a good read and a couple of Drumsticks (preferably the new Raspberry White Choc flavour or the surprisingly addictive Sweet & Salty Cracker inspired by Jatz) and try these on for size! Located at the end of Greenwich Point, the Greenwich Baths are one of Sydney’s best-kept secrets. Overlooking the CBD, you have to pay an entry fee but trust us when we say that it’s worth every cent. Get there early to secure yourself a sun lounge but make it snappy—the baths are closed from April to October. 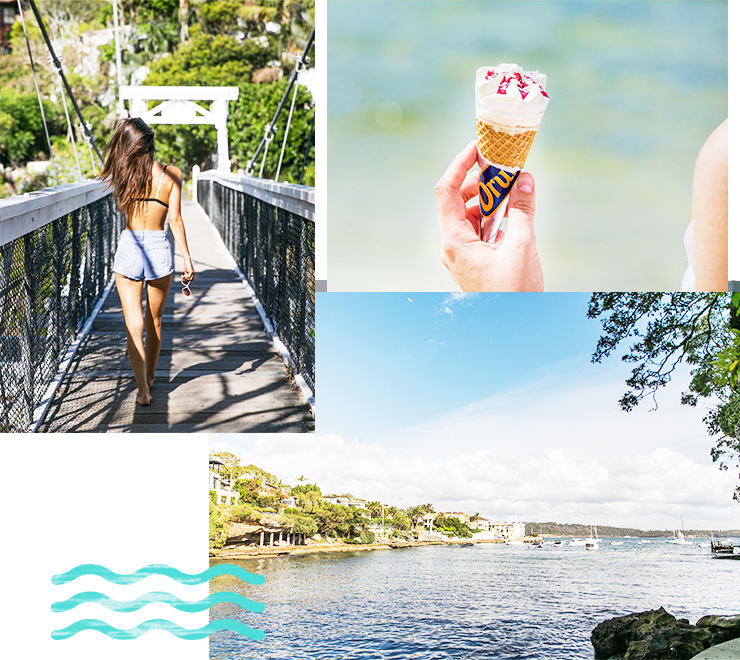 Tucked away in the oh-so-exclusive neighbourhood of Vaucluse, you’ll find top-secret Parsley Bay. Complete with an enclosed swimming area (to keep away those pesky bull sharks), this harbour beach was made for snorkelling, swimming and sun tanning. 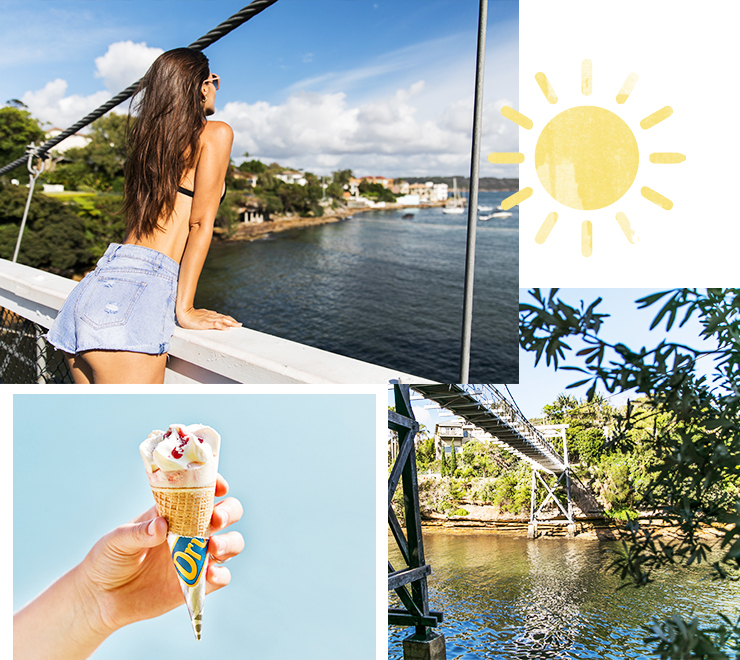 The Parsley Bay Bridge is an Instagrammer’s paradise and there’s even a kiosk on site when you feel like an ice cream. Talk about #dreamy. At the very north tip of Curl Curl, you’ll find the North Curl Curl Rockpool. With two giant rocks in the middle of the 25m pool, whether you want to swim laps or simply lounge around in your ridiculously expensive kaftan, you’ll enjoy sweeping views over to Manly and beyond. FYI during high tide it can only be accessed via the coastal walk across the headland. Take the stairs from the base of the car park on Marine Parade and uncover Mahon Pool, a waterhole that we bet your besties haven’t heard about. With towering cliffs behind and spectacular views in front, expect to get a month’s worth of Instagram in one visit. If you’re taking on the Manly to Spit trek, it’s pretty much mandatory that you treat yourself to a dip at Reef Beach. Hidden away at Dobroyd Head, pack a picnic (or maybe just a pack of Drumsticks) and enjoy uninterrupted beach time minus the crowds (and kids!). It’s the kinda place you want to stay alllllll day so don’t forget the sunscreen. If you’ve never been to Resolute Beach, you need to get yourself there, ASAP (before it gets too popular, duh). It’s a bit of drive, then a bit of a hike, but as soon as your feet hit the sand, you can expect crystal clear waters and a whole lot of wildlife. Perched on a cliff face and rock platforms between Coogee Beach and Wylies Baths, McIver's Baths is exclusively for the ladies and children (no men allowed). Built in 1886—head back in time, round up your girl gang and gossip away your summer days under the sun. Start packing your beach bag and hunt these spots down while they're still secret!